Flax is great in baking! Eat a muffin for a mid-afternoon snack. Preheat oven to 350⁰F (180⁰C). Line muffin tin with muffin liners. For the topping: Combine quick oats, flax, brown sugar, pecans, cinnamon and flour; mix well. Add melted butter; rub ingredients together. 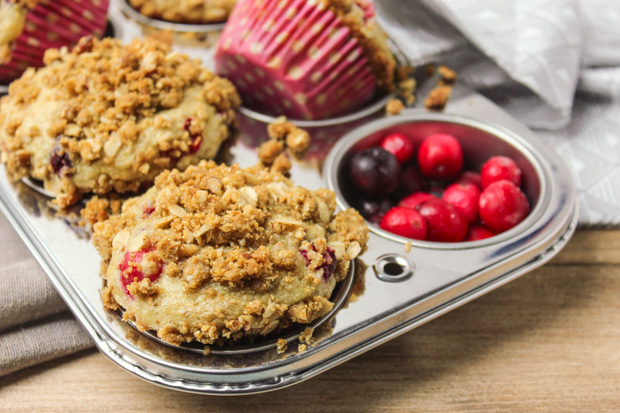 Set aside.To prepare the muffins: Combine flour, milled flax ,baking powder, baking soda, salt and sugar; mix well. In a separate bowl, whisk together canola oil and egg. Add skim milk, orange juice, rind and vanilla. Whisk until well blended. Add dry ingredients to liquid. Stir until dry ingredients are thoroughly moistened. Gently fold frozen cranberries into batter. Do not over mix. Fill each muffin cup 2/3 full of batter. Sprinkle topping on muffins. Bake for 20 minutes or until inserted toothpick come out clean. Serving Size: 1 muffin. Each serving size contains 1 Tbsp (15 mL) of flax.